Click HERE to see a short video of the opening day celebration! 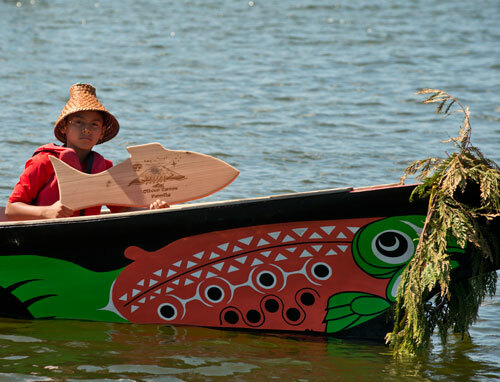 In July and August 2016 over 100 canoes made long journeys, arriving at the Nisqually Reserve near Olympia, Washington on Aug 6th. ​Here is a part of that story. he older generation looks on, remembering their own journeys across the waters of the Pacific Northwest, down rivers and up coasts. The arduous journey challenges everyone. 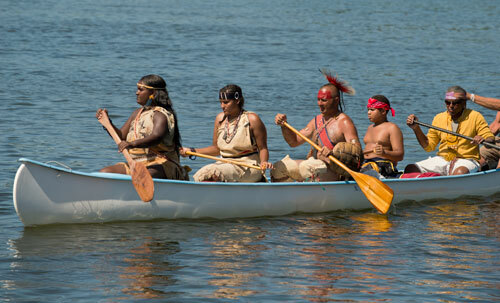 It brings the canoe families closer, even when tempers fray and muscles scream for a rest. ​After days and weeks, the journey’s destination comes into view. In 2016 the destination was the Nisqually Reserve outside of Olympia, Washington. This mix of deadpan humor and heartfelt respect for the earth ran like a light-colored thread through the event. 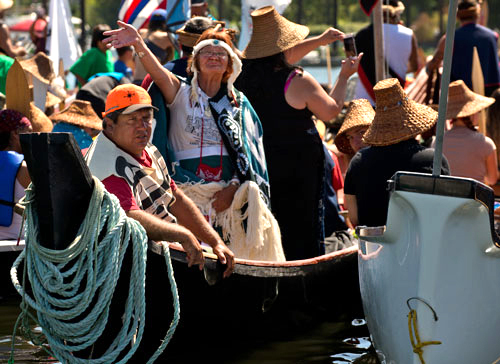 Saturday morning, July 30th, over 100 indigenous canoes entered Budd Inlet, hiding behind Priest Point until they were all gathered. 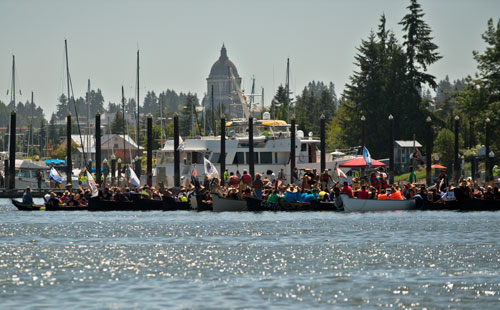 With the state capitol’s dome as a backdrop, the canoe families in their crests and regalia proudly paddled past the stands filled with cheering spectators. 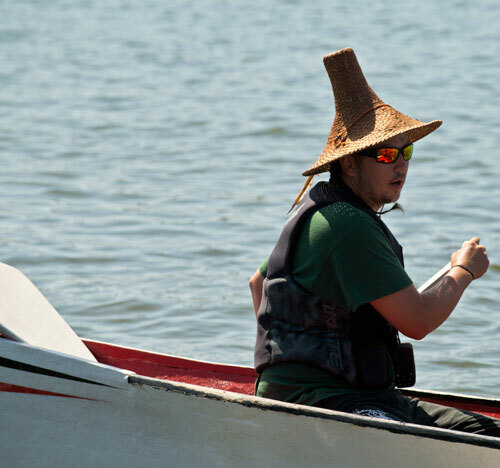 ​The Nisqually master of ceremonies announced each one by band and tribe: an Ojibway canoe from the East Coast; Haida and ‘Namgis in traditional dugout canoes; canoe families from Oregon, Alaska, Vancouver Island and Puget Sound; and many more. Protocol was strictly followed, as it has been done for thousands of years, underscoring the continuation of this ancient culture of ceremony and codes of conduct. Canoes waited at a log boom on the north side of the bay. 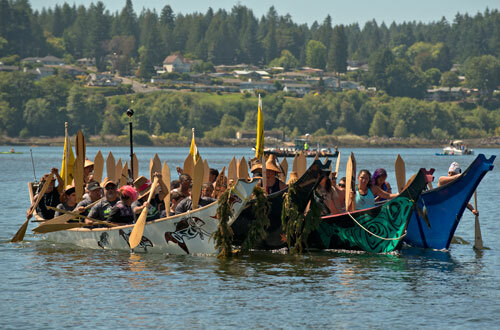 ​As each chief’s canoe paddled forward to the front of the stands, songs were sung and chiefs asked permission to come ashore onto Nisqually land. The response was immediate and enthusiastic. 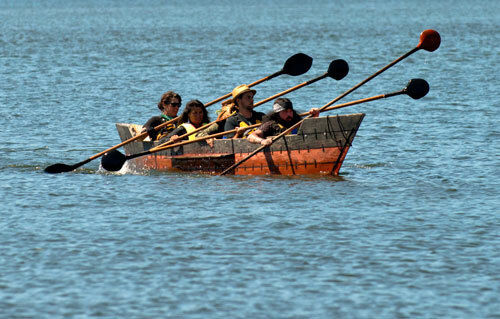 ​For hours, canoe families presented themselves to the Nisqually people. A Quileute canoe full of paddlers in wolf masks followed a Kwakwaka’wakw chief wearing an ornately carved head piece. ​Ceremonial blankets, cedar hats, painted canoes and paddles celebrated the strength and resilience of a culture so long castigated. Value of community, dignity of achievement and respect of tradition overlay all the proceedings. ​Laughter rang out continually, a rebuke to those who think this culture stale and dead. The state’s governor, Gov. 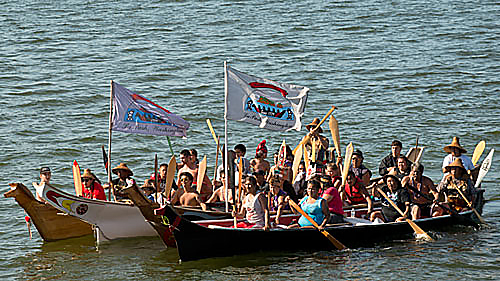 Jay Inslee, riding in the last canoe, proclaimed the official beginning of the 2016 Nisqually Canoe Gathering. Welcoming words wrapped the water-travelers in warmth. Songs and drums spread protection over the gathering. he canoe journey’s balm heals a little and a lot, depending on the paddler. ​It is an ancient and marrow-deep medicine, binding wounds and bringing strength. We are so fortunate to have borne witness.